The routes "From Lord Valley" & "NW Ridge, are sometimes combined as a pack route between the Lord Valley and the Lambert Glacier. 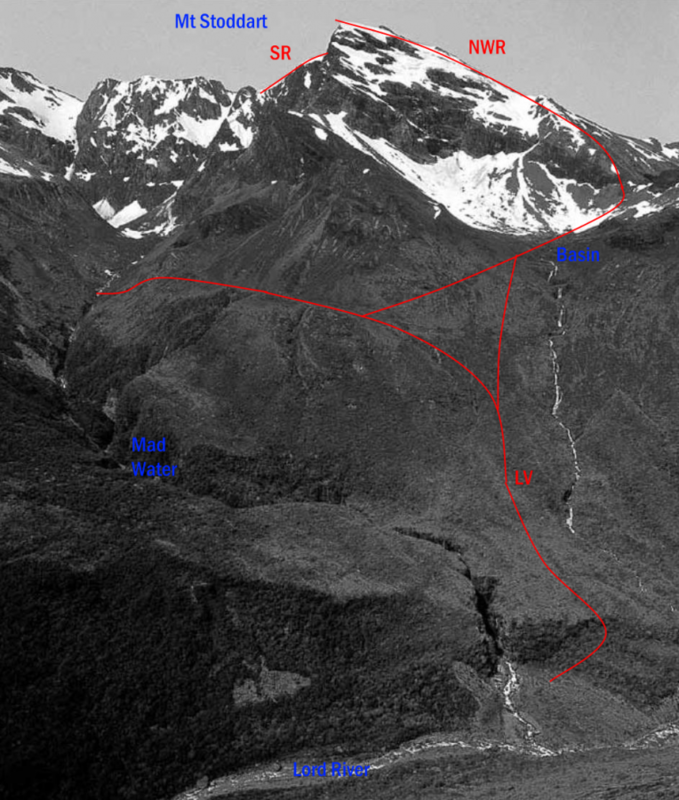 Teichelmann used this route on the 6th Feb 1911 on his first ascent of Mt Tyndall. It is also practical to access the upper Mad Water from the basin north of Stoddart. From the basin, sidle around and down to a shelf with two tarns at 1300m and continue along it to where it finishes, overlooking the Mad Water. The steep gully beyond, shown as a tiny creek on the map, is not practical to descend from up here. Instead, descend a steep rock and tussock rib on the true left of it with care, sidling into the gravel gully about 60m height above the Mad Water and following it down. Some looking around may be necessary but it works with care. Travel up the Mad Water at stream level from here is ok, but downstream is a waterfalled canyon. Slopes to the east above the Lord can be approached from here. To access the ridge from the Lambert Glacier, sidle up onto the O Neil Glacier and gain the ridge along snow or rock leads at about the 1640m contour. Among the rocks on this ridge are the remains of an abandoned, partly pitched, K2 style tent that could probably tell quite a story. The ridge above is easy, gravel and snow with a bit of bedrock near the top. EW Cotter, JL Clegg, MJ Conway, Jan 1941. Between the Madwater and the next stream downvalley, climb up through scrub heading south. Reach the scrubline at J35 313683, and head over a shoulder to the south into a basin at the 1400m contour. There are wonderful campsites in this basin and up on a terrace just above it to the west. Follow tussock and scree up to pt 1544m then climb the ridge, usually crossing at the 1900m contour to the rib overlooking the O'Neil Glacier for the final climb. From Gardarene Col. A schrund near Stoddart itself can be problematic.